Although I’ve only been at UNH for three semesters so far, I’m proud of how much I’ve pushed myself to take initiative and be an active UNH community member through service, research, and leadership. I’ve met some amazing UNH faculty, student leaders, and community members outside of UNH who do admirable work. I work with Kerry Nolte on her research on the healthcare experiences of persons who inject drugs. Through this opportunity, I was able to train to work with HAND UP, an organization that serves as a syringe exchange and to promote harm reduction in local communities that need it most. I also serve as a co-president for Partners for World Health and the vice president of the Red Cross chapter of UNH, where I’ve been given the chance to enact change and service through leadership, training, and service events like blood drives and fundraisers. On a smaller scale, I’m also proud to almost be done with my first semester of nursing courses. The courses have been both extremely challenging and rewarding, and I’m proud to almost be able to say I survived to see another semester. I’ll hopefully be starting my own research next semester on the needs of pediatric patients with neurological or cognitive disabilities, combining my academic focuses into one larger project. I would say that out of my non-nursing professors, Janet Polasky and her global citizenship class was my favorite. The course pushed me out of my comfort zone as a writing-intensive history course, but Professor Polasky was one of the most knowledgeable yet personable professors I’ve had the pleasure of encountering. We were allowed to be creative with our final projects, from cooking authentic Italian meals to comparing the book, movie and musical versions of Les Misérables to the actual events of the French Revolution. For my nursing courses, it’s difficult to choose a favorite professor, as I haven’t had a nursing professor yet that I disliked. If I had to choose, it would be Michelle Lovell, who teaches the nursing fundamentals course. Her course serves as a base of nursing knowledge and I have never felt more engaged in an 8 am course. She provides many resources for us to study and is always available to answer any questions. She also made all 80 of us heart-shaped sugar cookies one day, which I think speaks to how she cares for her students both academically and personally. My drive comes from my desire to become the nurse I look up to: the kind of nurse I see in every healthcare setting I’ve been in, the professors who teach us, and the older nursing students I look up to for guidance and support. I see the role of the nurse as one that combines compassion with intelligence and skilled care. I want to push myself both academically and as a leader, so I can be a better advocate and caregiver for every single future patient I encounter. Partners for World Health is an organization that started in 2007 when Elizabeth McLellan, RN, MPH, started to collect discarded medical supplies and store them at her house while working as a nursing supervisor at Maine Medical Center. 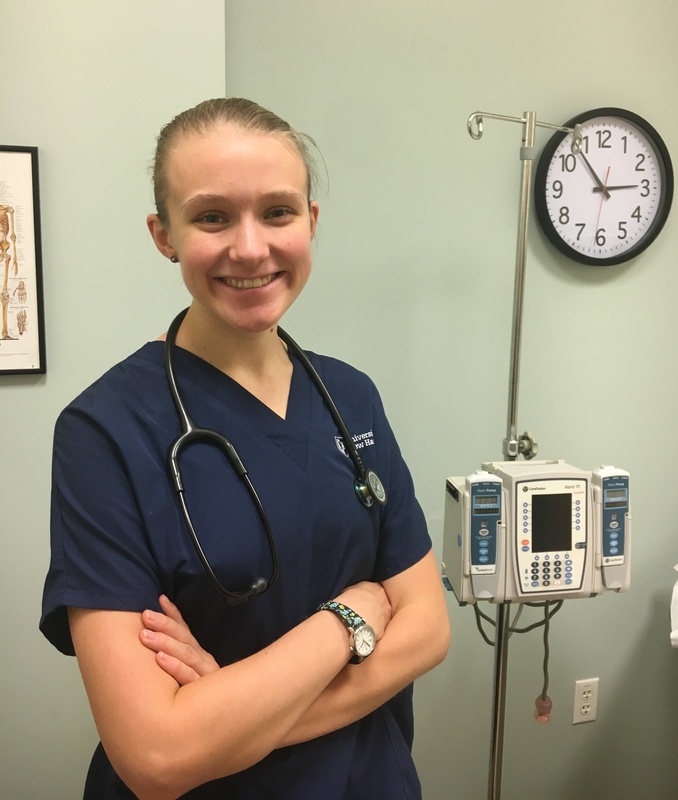 She had spent some time working overseas and saw the lack of supplies and resources for the clinics and healthcare facilities in underdeveloped nations. I first encountered the organization when I went to a volunteer event with my Hamel Scholars program at their main site in Portland. It was this experience that peaked my interest in both waste reduction and the issues facing clinics is developing countries. It also made me wonder if other students knew about these issues and that there were ways they could take action. We now have a UNH chapter of Partners for World Health which is a great way to establish more hospital connections and provide education and service to the community. We currently have 16 new members..
We are now working toward our goals of community education, local outreach to medical facilities, and service and fundraising opportunities. Next semester, we will organize monthly on-site volunteering days, contact local healthcare facilities, and hold at least one fundraising or service event. We hope to bring in speakers and experts for community education events on global health topics once we become more established. I feel hopeful in knowing that I can make a difference both in the community and across the seas at the same time, and I hope we can show other students that they can make an impact on global health right here on the UNH campus. While I am still figuring out my short-term plans, my long-term career goal is to go to graduate and become a nurse practitioner and work in acute pediatric care. I’m drawn to the fast-pace of emergency care, but I love working with a younger population, so I hope to combine these two goals. I love the community here at UNH. I’ve gotten to meet so many amazing people and have a variety of different experiences. There is really something for everyone here at UNH; if there is something you want to do, there are resources and ways for you to get where you want to be.